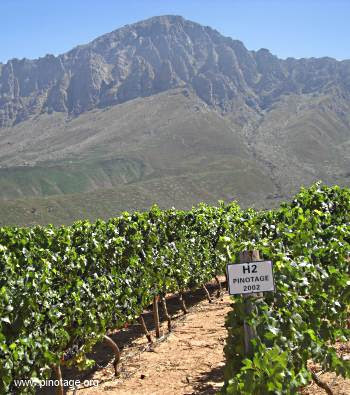 Silkbush Mountain Vineyards are located in the Breede River Valley, roughly midway between Worcester and Tulbagh. The name is probably unfamiliar because they have only released a couple of vintages wine under their own label but you may have drunk wine made by others from their grapes, including Flagstones Writer’s Block Pinotage which has twice been a Pinotage Top 10 winner. Silkbush was bought in 2000 by Californian Dave Jefferson and a consortium of American investors and comprehensively replanted by his South African partner, General Manager and viticulturist Anton Roos who lives on the farm. 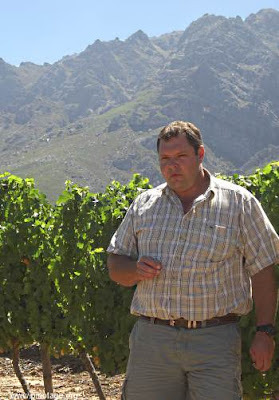 Just before returning home from the Cape I visited Silkbush where Anton (pictured above)found time in his busy schedule to drive me up the mountain to the Pinotage vineyard. On the way he told me the farm covers 140ha of which 87ha are planted to vines. Cabernet Sauvignon, Shiraz, and Pinotage are the most planted varieties and they also grow Merlot, Petit Verdot, Malbec, Cabernet Franc, Viognier, Semillon and Sauvignon Blanc. The Pinotage vineyard is at the highest point of the farm at 730 metres, on the upper corner of the hillside. 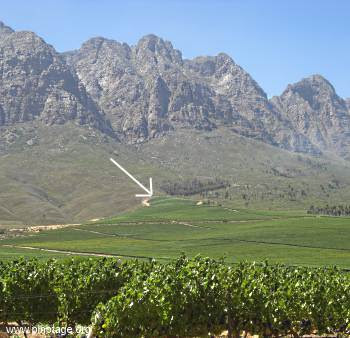 (arrowed in above picture) Mountains rise steeply beyond; one of them is Sybasberg which translates as Silkbush Mountain and gives its name to the farm. Looking over the vineyards, I could see the valley stretching out into the distance to mountains opposite. The sky was deep blue without a cloud with a raptor lazily circling above. It is a most beautiful location and there is a guesthouse on the property that can be booked. It was originally intended for the investors but (it seems amazing to me), with the exception of Dave Jefferson, none have made the journey to this most beautiful of winelands. The vineyard slope faces West-North-West and is always two degrees C cooler here than the valley floor. The soil is shale and quartzite. It is naturally loose and stays loose but there aren’t many nutrients so they don’t get vigorous vine growth. Silkbush aim to harvest just seven tons per hectare. Quality is the driving factor so they remove half of the crop at 80% véraison. Leaving it this late maintains berry size. 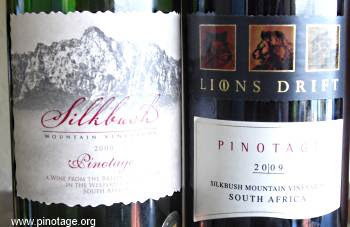 Up to now Silkbush have concentrated on producing grapes for partner wineries but they have reserved some rows of the high Pinotage vineyard for themselves which they market under the Silkbush label in South Africa and export as Lions Drift Pinotage. Already Lions Drift is listed on Silversea Luxury Cruise Lines and American Airline’s Business Class. I tasted the 2009 vintage. It has good dark red colour with an inviting nose. There is an explosion of ripe fruits on the palate, blackberry with damsons underneath. There’s a touch of oak, really nicely integrated, that leaves a trace of vanilla and a pleasant grip. This is a clean, fresh, modern fruit-forward Pinotage with a good fruit-acid balance of making it very food friendly. It’s great drinking now but I’d like to drink it in a couple of years to develop because I think it is going to be a stunner. Silkbush don’t yet have their own wine making facilityry so the wine is made at Waboomsrivier, a stone’s throw away, under the auspices of Bennie Wannenburg who’s made many a prizewinning Pinotage. Great fruit, great winemaker, great wine. Silkbush labels. Left is the Silkbush label for South Africa, on right is the export Lions Driftlabel. Wonderful place not only for wine-growing, but also for spending vacation. Two small refinements to your comments: the 7 tons/Ha for Flagstone is obtained by intensive thinning, as you described, and results in very concentrated wine. The same grapes for our Lions Drift and Silkbush labels are from blocks just a bit lower on the mountain and not so heavily thinned. Because these blocks yield more fruit/Ha, we can sell the end wine, still a lovely Pinotage, at a lower bottle price. Lastly, the luxurious Kingsbury Cottage has been enjoyed by several of our partners from the States but by more South Africans all the time. Watching the sunset while enjoying our Pinotage on the stoep is definitely an ethereal experience. Do come again!